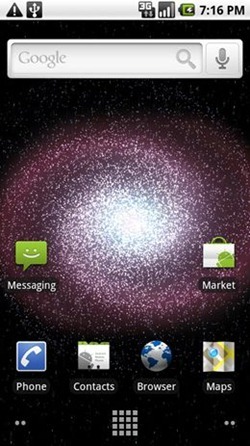 The latest Nexus One firmware with Android 2.1 (Build ERD79) has been successfully ported over to Motorola Droid. Support for landscape mode, live wallpapers, installation of paid apps from Marketplace and keyboard with backlight are all said to be working in this version of Android 2.1 for Droid, compared to the last one which was leaked earlier this month. Both Motorola and Verizon has plans to bring Android 2.1 update to Droid as soon as Google makes it an official release. If you fancy getting this latest leaked Android 2.1 ROM from Nexus One over to your Droid now, head over to AllDroid forums and get the required files needed to get this working. You’ll need to have a rooted Droid. Follow our step by step guide posted here to learn how to root your Motorola Droid if you haven’t already.